HOW best does an oil-rich dictator, who rigs elections at home and locks away those who dare to grumble, try to burnish his international reputation? 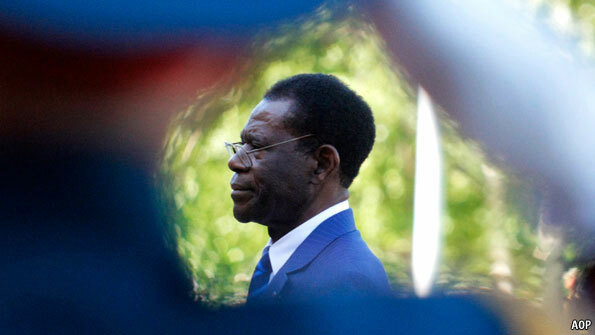 That question puzzles one of Africa's oldest and least pleasant incumbents, Obiang Nguema of Equatorial Guinea. Along with Zimbabwe's Robert Mugabe he has enjoyed well over three uninterrupted decades in power. Now the kleptocrat—once famously dubbed a "tropical gangster"—is eager to be looked upon more kindly by outsiders. Yet diverting millions of dollars to pay lobbyists and PR firms to come up with bright ideas has not exactly brought good results. For example a trip last year for British parliamentarians to Equatorial Guinea proved a public-relations disaster. Perhaps that was to be expected—it was organised by an individual whose only other engagement with the country was his association with a bungled 2004 "wonga coup" by half-witted British mercenaries. Another PR effort has fared little better. Two years ago a proposal was raised to divert official funds to endow a prize in the life sciences to be named after Mr Nguema and dished out by UNESCO, the Paris-based bit of the United Nations concerned with education and culture. That the $3m or so involved could have been used on hospitals or schools in Equatorial Guinea seemed not to trouble the UN, the PR firms or Mr Nguema. Nor did UNESCO's spectacularly dozy officials at first grasp that taking money from a grubby dictator might cast their own organisation in a dim light. UNESCO initially insisted it would push on with the prize. But after pressure from human-rights groups, activists from Equatorial Guinea and newspapers (including The Economist) the UN rethought and sought ways to postpone or cancel the prize. This month, however, the board of the UN body appeared to hand Mr Nguema a success, voting on March 8th to rename the prize and to push on with it. That looks a dismal decision. A plea from human-rights groups fell on deaf ears. Similarly ignored was a letter smuggled from a jailed opposition activist, Dr Wenceslao Mansogo, in Bata, Equatorial Guinea, imploring UNESCO not to endow the prize but instead to demand that Mr Nguema release political prisoners. The director of UNESCO, Irina Bokova, who belatedly realized the damage the prize is doing to the UN body, even spoke against it. She pointed to international criticism of the prize, lamented that it has already served to "divide" countries, cited attacks by Nobel Laureates on the process and the refusal of experts to sit on the jury for offering the prize. All to no avail. The member states on the board pressed on. But Mr Nguema's success is more limited than he might imagine. An official response from Malabo, the capital, indicated that celebrations followed the recent announcement. But with luck the prize will never be handed out. Ms Bokova should be able to ensure her bureaucracy does what it is very best at: masterful inactivity. Legal wranglings could bog down the prize for another year or two. Some suggest that by taking funds from Equatorial Guinea the UN body might be charged with money laundering, under French law. All the UN needs to do, suggests a person who has followed the sorry saga for years, is to drag on the whole affair and prevent the prize being issued before the end of 2013, when a "sunset clause" would kill it off in any case. Mr Nguema and his PR companies, however, will sadly almost certainly be around for many more years yet, with plenty more such schemes to try.